Doctor Who: Revisiting THE CRIMSON HORROR | Warped Factor - Words in the Key of Geek. It strikes me as I write this retrospective that there has been an awful lot of 11th Doctor stories set in historical periods. Conversely, some Doctors, such as the 3rd and 7th have hardly any at all, particularly where television stories are concerned. For the 11th Doctor we had The Vampires of Venice, Vincent and the Doctor, The Pandorica Opens, The Curse of the Black Spot, A Town Called Mercy and The Snowmen, not to mention a whole bunch of comic strips from DWM, DWA and IDW as well as a clutch of audios. A lot of Matt Smith and not a single one I haven’t enjoyed among them. 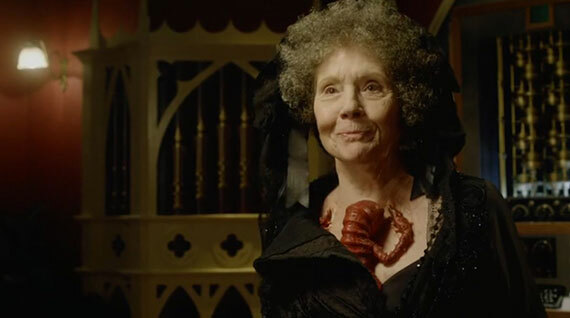 The Crimson Horror, thankfully, continues the trend of top-notch Moffat-era Who. I actually re-watched this story ‘back to back’ with The Snowmen. Seeing the contrast and complements between these two Victorian-set stories from the same ‘series’ makes for interesting viewing. The first striking thing is how we continue to see the Paternoster Gang thrust into centre stage (it’s a full 14 minutes before the Doctor appears properly), although this time for different reasons. In The Snowmen we focussed on Vastra, Jenny and Strax because the Doctor wouldn’t become involved in the mysteries surrounding them. The reason this time is because the Doctor can’t help because he has already been involved and has, shockingly, been rendered incapacitated. Of the three it was Strax who was more prominent in The Snowmen. Here it is Jenny. 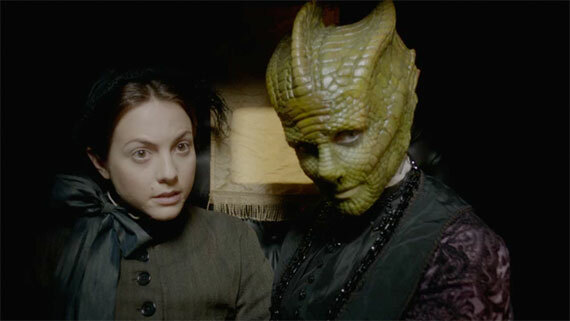 It is a pleasant change and also settled my fears about that the odd relationship between Vastra and Jenny seen in Deep Breath, where she treats her like a servant even behind closed doors. Jenny is placed into the companion role – and very good she is too. I’ve been a bit indifferent to Jenny through their other appearances, but she’s very strong here. Vastra fulfils the Doctor’s role to begin with. When the Doctor is rescued, though, it is interesting that Vastra almost disappears from the narrative. Strax, also, has less to do in this story – although Dan Starkey is consistently great and he does have some good gags. The Doctor and Clara are a great team and this is a good story for the pairing with lots of ‘banter’ and mutual admiration. Their confrontation with Mrs Gillyflower towards the end of the story is a great scene, aided, of course, by a brilliant performance from Diana Rigg as the principal villain. 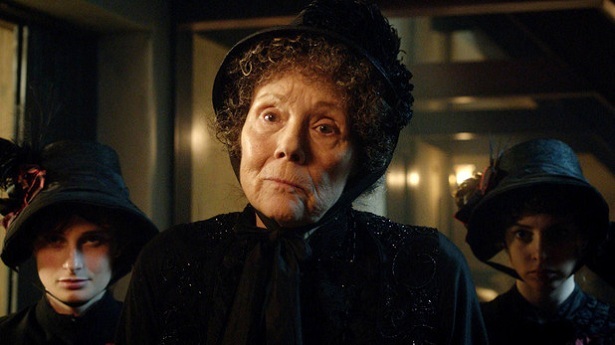 Rigg is simply superb, clearly relishing every syllable of the script – from her fire and brimstone preaching at the start, to her cackling villainy at the end; every moment is pure Doctor Who gold. I particularly love the exchange about ‘the wrong hands’. Rachel Stirling, Rigg’s daughter in real life, plays Gillyflower’s blind daughter, Ada. She, too, is excellent and her growing realisation of the truth of the situation makes for some tense and heart-rending scenes. The rest of the cast is minimal: a bunch of non-speaking extras, a northern woman who helps Jenny, a man who is merely there for a running gag, and a mortician; but when you already have 2 regulars, 3 semi-regulars, a villain and a ‘sympathetic’ character, there isn’t much room for anyone else in 45 minutes. Mark Gatiss seems to be trying to squeeze a 4 part story into the length of a 2-parter. He achieves this quite well for the first 35 minutes by using a fun flashback scene to show the audience what the Doctor and Clara were up to before the Paternoster Gang arrived. Those flashbacks are essentially what would have formed Episodes 1 and 2 of a longer story – there’s at least one obvious cliffhanger (the Doctor being submerged in red goo) - and I, oddly, got a real Baker/Sladen vibe for some reason (maybe it’s the bowler hat – a bit like the one from Horror of Fang Rock). The close of the story feels ever so slightly rushed, which is something I’ve commented on before. Series 9 is, of course, having a lot more 2 part stories and it is interesting seeing how this is affecting the pacing. The ‘monster’ of the story ‘Mr Sweet’ is a slightly odd addition which I’m not fully convinced works. It’s a disquieting image to see it suckling on Diana Rigg and I like the idea of a parasite from the Silurians’ time. It’s just that I’m not 100% sure how Gillyflower discovered it’s abilities, it’s propensity for symbiosis or how it could further her insane plans. There is a fleeting mention of her being a chemist, but that’s about all we get. I’m all for a script allowing audiences to fill in the blanks, but I think this aspect of the story suffers from the slightly rushed climax. Historically, we get a different slant on the Victorian era to that seen before in Doctor Who, with the setting being ‘oop North’, specifically Yorkshire 1893 (with a caption in the opening outright stating this time and place – something which isn’t used in Who as much as you’d think it would be in a show about time travel). It’s recognisably Victorian but it’s more open, more ‘industry’ than the dark, foggy cobbled streets of London. The scenes seem open, wide. It’s raining. The perfect, uniform world of Sweetville is in stark contrast to the higgledy-piggledy alleys of London. As a contrast to The Snowmen, it is striking. Sweetville, itself, has echoes of similarly named ‘ideal’ towns from the 19th century, namely Saltaire and Bournville. Saltaire was built in 1851, and its founder had a daughter called Ada. Sherlock Holmes continues to inform this era’s stories too with ‘The Repulsive Case of the Red Leech’ being an unseen adventure referred to in the Conan Doyle story, The Adventure of the Golden Pince-Nez. The costuming is sombre with strong echoes of the Salvation Army (founded in 1865) in Gillyflower’s minions. 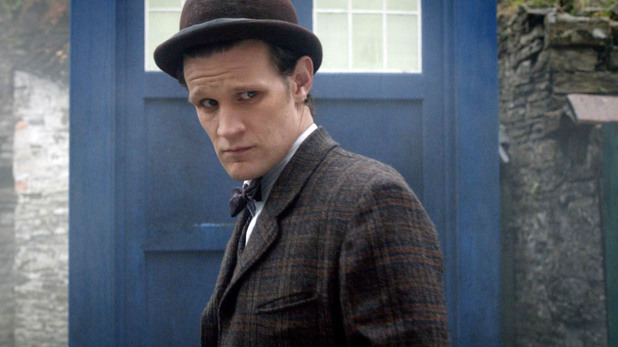 I also adore the Doctor’s costume in this story – although I’m less keen on Clara’s. It’s not as nice as either of her Victorian splinter’s costumes from The Snowmen, and her hair looks weird. The singing of the hymn, Jerusalem is, apparently an anachronism as the tune wasn’t joined to the words of William Blake’s poem until 1916. That aside, it is the perfect analogy for Gillyflower’s view of the paradise she hopes to achieve through her evil machinations. There is also the plot device of the optogram. Optography, and the idea that the eye retained the last image seen before death, was a popular belief in the late 19th century, to the point where the police began to use the technique in an attempt to solve murders, including one of Jack the Ripper’s victims. It was seriously researched by some scientists of the time and, as always, Doctor Who draws on this contemporary belief to propel the plot by giving it some fictional proof. It is similar to how the 19th century fascination with spiritualism has been ‘proved’ through a Doctor Who lens. Throughout the new series, I’ve been underwhelmed by most of Mark Gatiss’s scripts. The Unquiet Dead, Robot of Sherwood, The Idiot’s Lantern, have all left me a little non-plussed (although The Unquiet Dead improved somewhat when I gave it a rewatch). The Crimson Horror is definitely my favourite of his stories and, for my money, his best script. It plays to his strengths as a writer with a strong League of Gentlemen vibe running through it far more than in any of his other stories. He writes well for the Paternoster Gang, the 11th Doctor and Clara and for his main guest cast. The episode received criticism at the time for the kiss/slap scene between the Doctor and Jenny. I know the sexism accusation keeps rearing its head for Moffat Who but I don’t think this scene contributes much for the complainers’ arguments. The Doctor is newly out of the ‘crimson horror’ and is loving having his full faculties back. Jenny is a Victorian woman with the morals that entails, despite her ‘modern’ relationship, and is all fired up ready for a fight the moment she walks into Sweetville. And I don’t hold much to the idea the Doctor is checking her out when she reveals her catsuit. He is reacting to the surprise of a skintight suit on a Victorian maid. He isn’t leering. He’s being the Doctor – an alien who doesn’t quite know how to react to something he knows would receive comment from other species’ males. 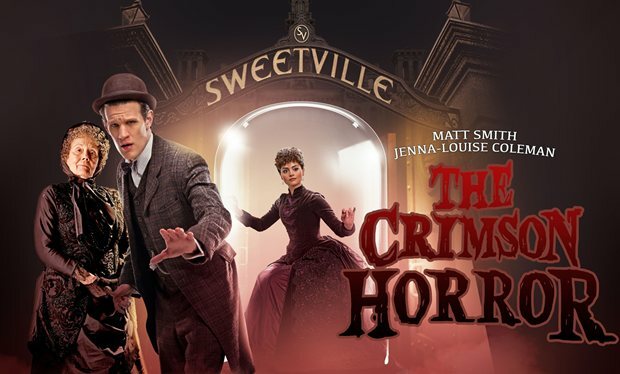 The Crimson Horror is a strong story with a memorable villain, great dialogue, the welcome presence of the Paternoster Gang and a fun TARDIS team.